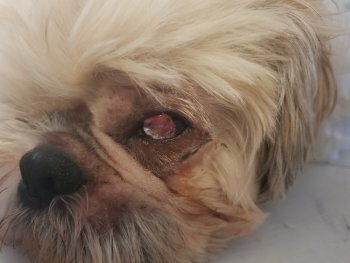 My beautiful little Shih tzu is having a bit of a rough time and has a corneal ulcer. Thus far.. it's been 2 weeks and were not seeing any improvement - various creams, drops, painkillers, antibiotics etc. Its looking like he'll be having Grid Keratectomy end of next week - unless a miracle occurs. Anyway, just wondering if anyone in the dol brains trust has experienced corneal ulcers? And if there other things I should be thinking of doing to help the little munchkin? @crazydoglady99, we use a cream called Opticlox on our sheep and goats that get corneal ulcers from hay seeds... works great and can also be used in dogs. I've got one little fellow whose eye was completely white and gummed shut nearly 2 weeks ago, and now has only the tiniest shadow of cloud. Should be all fine by Monday. Application once daily also makes it easy to treat with. I've managed to get some on my tongue and it seems to have a numbing agent in there, so it makes them feel better too. Wow T!! Have not heard of or tried Opticlox. I will definitely ask about it. Thank you so much!!! I'm ok with him having surgery, as he is miserable being unable to see anything (+/- the discomfort). He only has one eye, and he is a very nervous/easily stressed dog. So pretty keen to get it resolved for him. Poor little monkey. Full blown ulcers where the eye is all white and gummy muck coming out tend to take between 7-14 days to heal completely. Pity it's too strong for rabbits and guinea pigs, as the stuff we have to use on them (Atropine once, then Tricin 3-5 times daily) takes up to 6 weeks to do the same job as the Opticlox. What's that T.. you're going to send me some Opticlox..
6 weeks to heal! Yikes!! I think Amacin, and Tricin caused irritation. He seemed to be in more discomfort after administering it. Anyways, hopefully it doesn't take too long for the vet to Opticlox in. I googled it, and can only see pharmacy sites with the prescription only blurb. I'll buy a whole box if I have to! Totally worth a try!! Breeds with large protruding eyes and short or flat faces are particularly susceptible to eye injury. I have decades of experience covering dozens of different categories of corneal ulcer. (1) get immediate vet consult within 12 hours of first noticing symptoms. Sadly, it is not uncommon that inexperienced carers don't notice the first symptoms and don't consult until they see the discolouration on the eye surface of an ulcer. Delayed start to treatment will almost invariably lead to a much longer recovery time. (3) The medication schedule is rigidly adhered to - if the vet suggests every four hours for meds, then the alarm gets set and that is continued through the night as well as during the day. I also add neutral moisteners to the eye surface (like Genteal gel or similar human artificial tears) in between medication applications.Adding those extra protective tears has a soothing effect I have found. It is a very intensive regime for one person, but it works. Pain killers and a cone should be used if the patient is worrying at/rubbing the eye. Normally the above regime will clear the ulcer without any residual scarring. The time it takes depends on both the initial depth/severity of the injury and how soon the problem was noticed and treatment started.If you have an actual penetrated ulcer, not just a surface scratch, three weeks would not be unusual BUT you should (or the vet should) be able to see improvement during that time. Surface scratches should heald in a few days. Basically, to heal there needs to be a good blood supply to the cornea. That is the reason for darkness and for all the antibiotics etc to clear any infection which can hinder the blood supply. 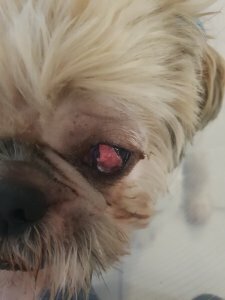 A treatment of topically applying a serum made from the patient's own blood has become popular with pug owners overseas and has been used here equally successfully - it has had excellent results with even very deep ulcers which would otherwise have required eye removal. I personally dislike grid keratotomy as a treatment. To me it should only be used if the injury is long neglected and permanent scar tissue has formed, creating a barrier around the ulcer that hinders the blood supply to the ulcer. But it seems fashionable these days to scrape away at the eye surface in the hope of triggering healing. I would only allow a veterinary eye specialist to perform that surgery if it was me. The third eyelid closure surgery can be competently performed by nearly all vets, though. What medications are you currently using, and how often? We've tried Chlorsig ointment, Amacin ointment, Tricin ointment, 9 days of Amoxicillin, 5 days of Metacam.. and multiple blood tests at my request as I wanted assurance there wasn't something more sinister going on. The biggest challenge is that he only has 1 eye. At the moment he can see a tiny bit. He is a real stress-head, he gets very upset over each vet & car trip, or thinking he is separated from other dogs. So.. it has been 15days since it appeared - thus far no improvement. I sort of feel it might not be in his best interest to keep plugging away, rather than taking a more invasive approach, as he is very stressed and miserable by the whole thing. Although I do feel he is happier since starting the doxycycline.. so there may have been something lingering. Excellent that he is on the serum! I would add a long lasting artificial tears (gel form is best - available from any pharmacy over the counter. Genteal gel is my favourite) every five hours (but not within an hour of the serum so you need to work out a schedule LOL). And avoid all strong light. Yep, 15 days is not too scary a time if it is a deep ulcer, certainly not if you have been changing meds during that time - from the list of things you've already tried, you haven't been using the serum all that long yet? Try not to let his stressing stress you to much, give the serum etc. another 10 days before considering anything surgical. If no improvement at all in other 10 days I would consult with a veterinary eye specialist. And don't panic too much that it is his only remaining eye, he relies more on his nose than his eyes anyway, which is always good to keep in mind! With the goats and sheep, the Opticlox is magic stuff. It is also supposed to be fairly long acting (one dose can be used every 48-72 hours on lesser cases), but used daily when the ulcer is bad (total eye cloudiness, or even totally solid white) has seen them clear in 10-14 days maximum. And like I said, when gotten to immediately, it can have them all fine with a single dose. The best part about Opticlox is that it's a once daily application at most... so it's a hell of a lot less intrusive for the animal being treated too. The little monkey boy has actually had surgery today (not planned, but at our checkup it was looking to be the best option). Wasn't Grid Keratectomy but some fancy name procedure that is essentially a corneal graft. Unfortunately his eye had already ruptured as they discovered once he was sedated . 50/50 chance he will see again, depending wether or not the graft takes. Will have to wait and see how he heals over the coming days. You can add the pic as a spoiler if you think some might be squeamish @crazydoglady99... I'd like to see it... animal health things fascinate me. Your poor little love. How distressing for you both. I hope he's resting comfortably and heals up very quickly. Close your eyes now if you dont like grosse stuff! Will try get a better pic when he is up and about next.